DNM Hot Pot has debuted at 1115 Clement St. (between 12th and Funston avenues) in the Inner Richmond, specializing in a customizable, communal dining experience. "We serve authentic tastes from Inner Mongolia--rich, savory and full of spice," the restaurant says on its Facebook page. "Big heart and big flavor." 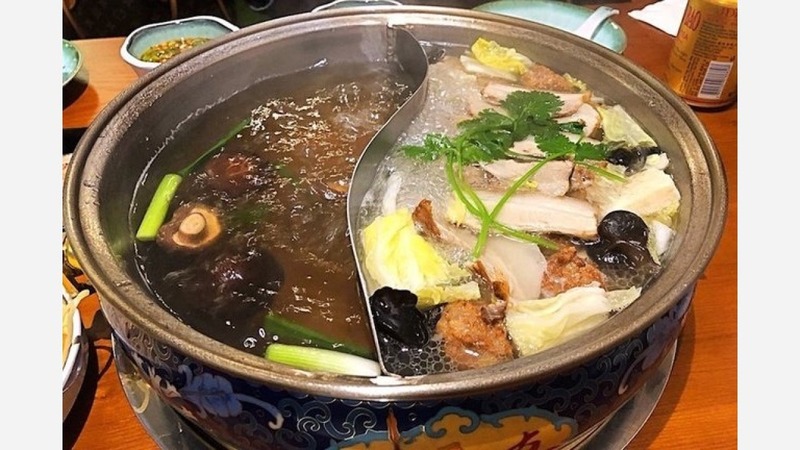 The hot pot experience involves dipping thinly sliced meats and vegetables into simmering pots of broth (like clear, spicy, tomato and mushroom). Protein options include beef, lamb (tenderloin and marrow bones), pork three ways (meatballs, sliced and fried) and the house special (lamb organ meats). For $2.50 per person, there are unlimited self-serve dipping sauces. With deeply-hued blues and greens, the restaurant's Mongolian focus extends to the decor, which features a battle-scene mural and a morin khuur(horsehead fiddle) hanging from the wall. With a five-star rating out of 15 reviews on Yelp so far, DNM Hot Pot is on its way to developing a local fan base. "The broths are absolutely divine -- clearly homemade instead of the salty mess some hot pot restaurants pass off as soup," wrote K.C. "So excited to welcome this place to the neighborhood. We will definitely be back." And Lennard C. said, "The ingredients were fresh, the service was attentive and prices reasonable. Make sure to try the DIY sauce cart! DNM Hot Pot is open daily from 11:30am-2:30pm, Friday and Saturday from 5:30pm-11:30pm, and Sunday-Thursday from 5:30pm-10:30pm. Have you come across a new (or closing) restaurant? Text your tip and a photo to 415-200-3233, or email tips@hoodline.com. If we use your info in a story, we'll give you credit.